Will the Swiss Guarantee CHF 75,000 for Every Family? In early June the Swiss will be called upon to make a historic decision. Switzerland is the first country worldwide to put the idea of an Unconditional Basic Income to a vote and the outcome of this referendum will set a strong precedent and establish a landmark in the evolution of this debate. 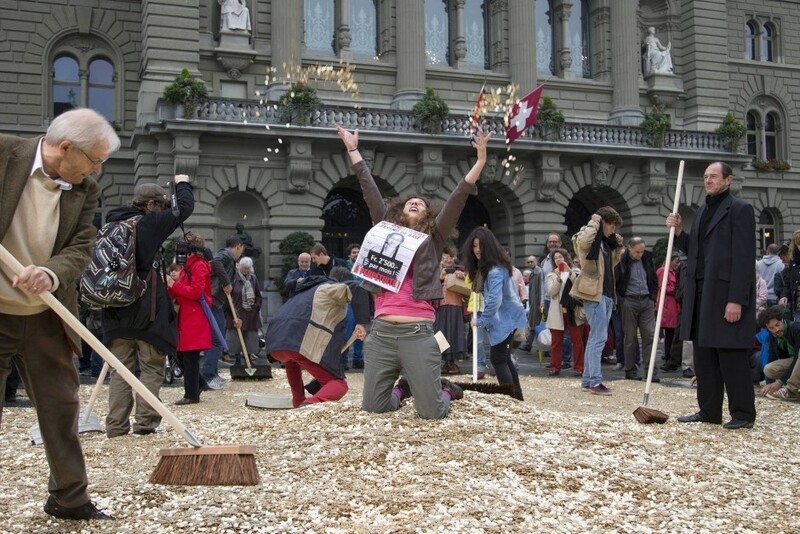 The Swiss Basic Income Initiative in a demonstration in front of parliament. As we have previously reported (see “Swiss Parliament Shoots Down Socialist Utopia” for details), Switzerland’s parliament has already rejected the idea, with even the socialists voting against it (proving that they are still in possession of most of their marbles and quite likely in possession of an abacus as well). Photo credit: Peter Klaunzer The Swiss public will have to approve or reject a change in the constitution that would allow for the introduction of an Unconditional Basic Income (UBI), or a preset, monthly minimum income to be paid out by the government to every adult and child in the country if their income falls below a specific threshold. Even though details of this proposal have been few and far between, the most commonly cited amount of this guaranteed income would be 2,500 Swiss Francs for adults and 625 francs for children. The Swiss public will have to approve or reject a change in the constitution that would allow for the introduction of an Unconditional Basic Income (UBI), or a preset, monthly minimum income to be paid out by the government to every adult and child in the country if their income falls below a specific threshold. Even though details of this proposal have been few and far between, the most commonly cited amount of this guaranteed income would be 2,500 Swiss Francs for adults and 625 francs for children. The architects of the proposal stress that this government-guaranteed payment, unlike the current benefit programs, will be entirely “no questions asked”, i.e., it will not be means-tested and will apply to every person legally living in Switzerland. Currently, these are all the details that the Swiss have at their disposal to make their decision. No plan has so far been put forward to specify how such a proposal would be financed, whether an increase in income tax or VAT will have to be enforced, which specific existing welfare programs it would replace or how the glaringly obvious exploitation possibilities of such a plan would be avoided, without any kind of means test – or without “asking any questions”, according to one of the campaign’s catchphrases. The main argument of the supporters of this initiative is that it would support the people that will, or already do, lose their jobs to automation and technological progress; a defensive move against “the rise of the robots” as they put it. They also claim that such a measure will give people the opportunity to grow, to learn and to pursue skills or professional goals that are now rendered prohibitive by their current meaningless and mundane jobs, that they are forced into in order to simply pay their bills. 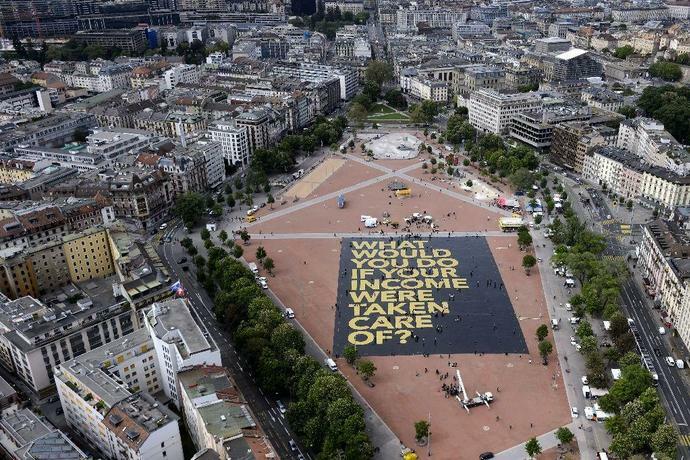 “What would you do if your income were taken care of?” asked the pro-UBI campaign in Geneva, with a poster that officially made it into the Guinness Book of Records as the world’s largest. Meet the world’s largest poster ever. As to the answer to the question, a number of people would likely immediately proceed to party. The poster unfortunately fails to ask “who is going to pay for it?” – or better said, who will be robbed at gunpoint to pay for it. The promise of a free lunch is by no means a new thing in politics. Getting “something for nothing” is an age-old shiny trinket that has been dangled before the eyes of the public since time immemorial. In fact, it has appeared so excruciatingly often in our political history, for centuries on end, that one would think that it wouldn’t work anymore; not in 2016, surely. And yet it does. UBI is the proof that there are still people who choose to believe that “no strings attached” freebies and gifts are promises one can rely on and build an economy on, especially when they are coming from their government and rulers. However, there are always some strings attached to such gifts and if history has taught us anything on this matter, it is the distinction between a gift and a bribe. Unsavory political ideologies and catastrophic cultural philosophies often tend to make their debut in front of the public hidden inside a Trojan gift horse. Unrealistic yet enchanting promises have always been a reliable political tool and it has never been a big strategic challenge to corrupt the people by granting the majority something that was stolen from minorities. 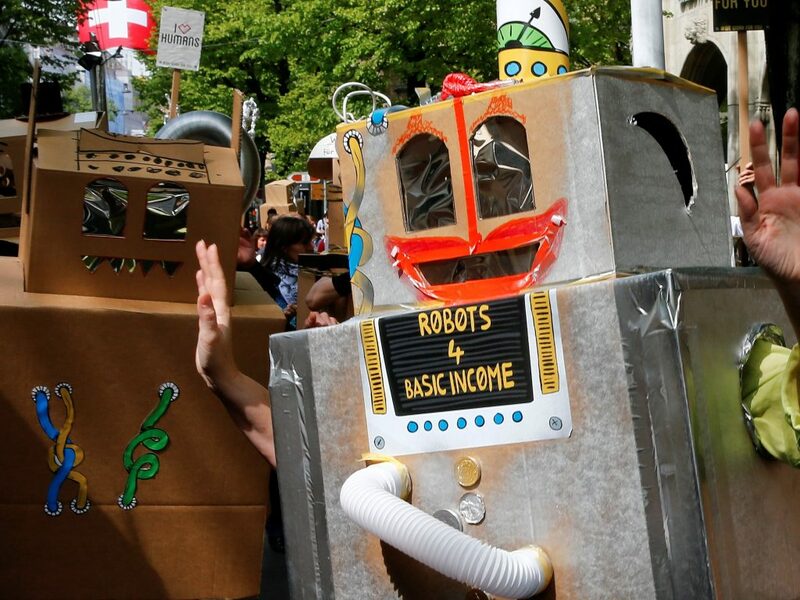 Another recent demonstration by UBI supporters in Switzerland – this one suggests that “robots” will actually pay for it all. This is based on a combination of the popular Luddite error that “machines will make us all jobless” (an idea proven consistently wrong since the early 19th century when the original Luddites went around to break machines, but who cares about evidence when changing the world is at stake!) and the fantasy that the world of Star Trek has already arrived, and machines will simply produce everything we need and want “for free” at the push of a button, in a kind of economic perpetuum mobile. 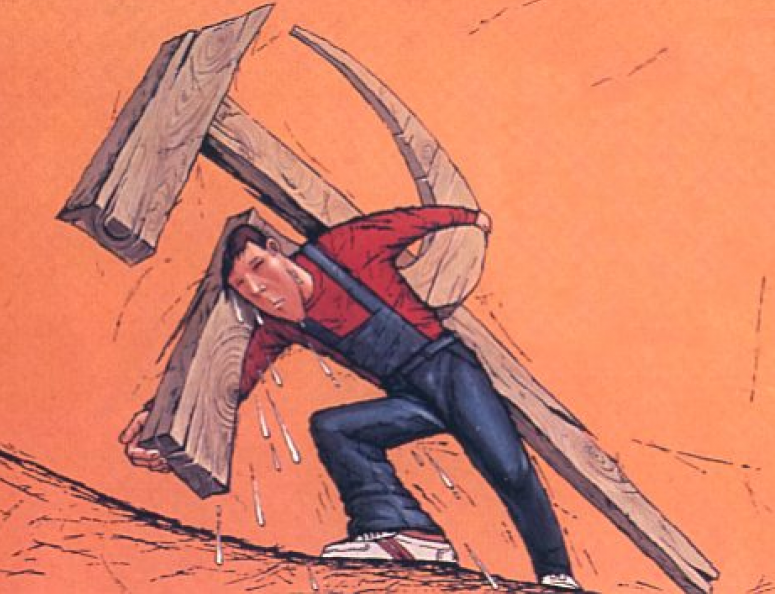 Thus, we can now get serious about erecting the long dreamed of socialist Utopia – and this time, we’re going to get it right, you just wait and see! 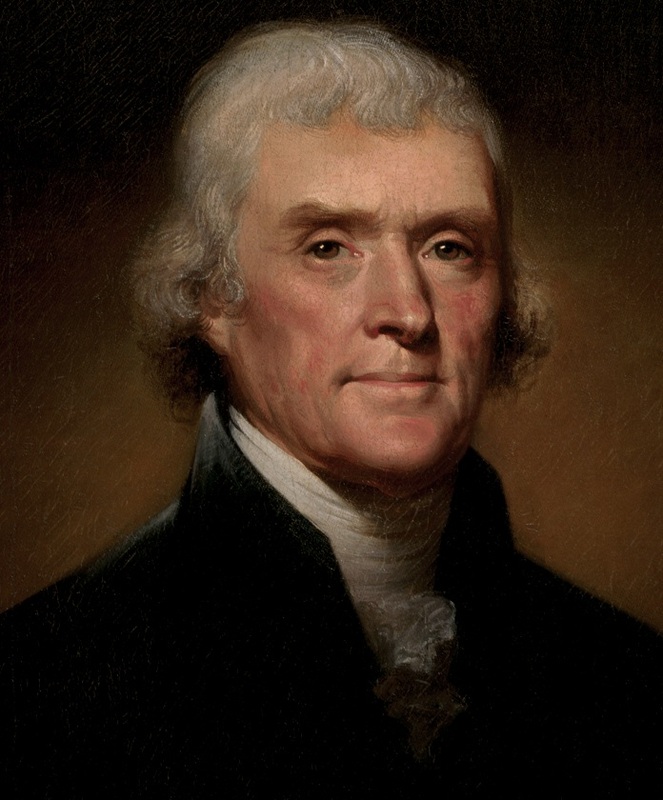 Thomas Jefferson knew a thing or two about the true nature of government. By accepting a “free lunch” offered by the government, one is no longer free, but becomes dependent on the whims of the ruling elite – which is of course precisely what the ruling elite wants. In other words, what happens in reality is the exact opposite of what the UBI supporters imagine will happen. They assert that a basic income distributed by the State will “free people”, as they will no longer be forced to deal with the drudgery of having to earn a living. Thus, in a quite Orwellian twist, dependency is marketed as “freedom”. Key figures of the pro-UBI camp take pride in claiming that the main motivation behind the campaign is not economic but cultural. They say this proposal aims to make people think about the nature of life and work, it is a way to liberate them from the jobs they don’t like but need, a status which the scheme’s advocates, quite unhistorically, equate to the indignity of slavery. On top of this, they claim, UBI will help society survive the imminent unemployment apocalypse: they believe that with the help of automation and artificial intelligence 50% of all the existing jobs will be taken over within the coming decade by computers and machines. 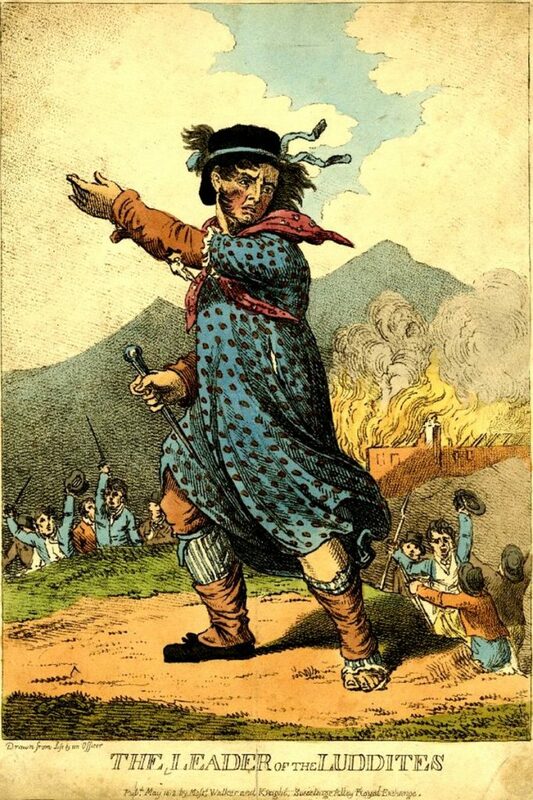 The original Luddites were slightly less imaginative: instead of demanding a basic income, they simply went and smashed the machines they thought would take away their jobs. The underlying notion was simply anti-economic: it asserted that the very goal of economic activity, namely producing more with less, was somehow “evil”. Taken to its logical conclusion, this means one would have to reject civilization altogether and return to the “noble savage” life of cavemen and jungle dwellers bereft of tools (a life that would be nasty, brutish, very short and marked by a distinct lack of iPhones). Such an argument might sound superficially rational, but it goes deeper than that: It presupposes that we as human beings see ourselves downgraded and equated to a machine, like just another cog that can be replaced at any time, in a system where man is literally defined as a human resource. The truth is that it is indeed a cultural debate, far more than it is an economic one. The only conceivable aim of such a factually unhinged and unfounded proposal can be to gauge the mind-set of the Swiss people in this moment in time. The outcome of this referendum can provide a valuable insight into the Swiss mentality, and whether the Swiss actually prefer collectivism over individualism. Such a signal could serve as cue for a further escalation of government empowerment: After all, the collapsing centralized system is bound to show symptoms of desperation by “doubling down” and accelerating and maximizing its centralization efforts. Thus focusing on the symptoms and secondary effects is futile; a real difference can only be made by addressing the root cause, the system itself. Since the collapse of the Soviet system (of which many prominent Western economists asserted as late as the 1980s that it would eventually overtake capitalism and free markets – which goes to show how utterly blinded by ideology and statolatry the profession has become), most socialists have stopped making economic arguments in favor of socialism, realizing they are no longer credible. Instead they are now making moral and cultural arguments in favor of collectivism. Allegedly, although it will make us poorer, socialism is “morally superior” to the free market system. One might want to ponder the victims of the Chinese Cultural Revolution in this context – when the protection of individual rights is abandoned in favor of vague and pious notions of the “collective good”, things often tend to get real ugly very quickly. Despite the economic non-sequiturs and the plain Utopianism that lie at the core of the idea of a Universal Basic Income, the concept seems to be gaining popularity worldwide. Canada is set to conduct an experiment with this idea later this year. The city of Utrecht in the Netherlands is launching a pilot program, Finland is planning a two-year trial and a British proposal is gathering interest, while the nonprofit group Give Directly will start providing a guaranteed income to 6,000 Kenyans this month in a decade-long scheduled program and track the results. The idea seems to be gaining traction due to the Western Left’s efforts, however the polls in Switzerland are painting a dramatically different picture: the UBI initiative is projected to suffer a crushing defeat. The Swiss have been voting counter-intuitively for years: When they held a referendum for or against six weeks of vacation, or when they were called upon to vote for an initiative advocating fewer working hours, or even when they made their choice on the issue of the minimum wage, they always delivered outcomes that seemed surprising to the rest of the West, especially the rest of Europe. Up to now, the Swiss have consistently rejected interference by the state when it came to such topics and have refused to grant more powers to their government. Even in recent years, when the trend in favor of aggressive state expansionism seems to be stronger than ever, Switzerland appears to still hold the line as the last bastion of liberty that remains standing. So what is so different about the Swiss then? Switzerland is indeed very different, because it became a nation by its peoples’ own will, based on limited government, strong private property rights and a direct democracy founded on the principles of subsidiarity. This has always required open dialogue and being exposed to different ideas and values: Vigorous debate itself leads to an enlightened society. Thus, the essential difference lies in the nation’s culture, mentality and philosophy. High up in the Swiss Alps, where they are playing strange instruments. The Swiss have always stood up for the rights of the individual against the State. They successfully defended themselves against the Hapsburg dynasty and other would-be conquerors, and attempts to introduce collectivist decay from within have been consistently rejected as well. The Swiss have grown up in an environment in which the people were always able to decide for themselves, but they also have a long tradition of doubt and of dissent. Every critical issue is discussed and decided by the people, the actions of government are subject to the judgment of and limited by the citizenry. All viewpoints are heard, even anti-establishment voices have their say, and critical thinking provides the basis for society’s future. However, this is only possible when people rely on their own mind to think about the issues individually and independently. Switzerland is therefore quite a hostile terrain for those who wish to promote “free lunches” and “no strings attached” gifts. A long history of independent thinking, of consequential analysis and of government limitation, makes it very easy for the Swiss to see past the populism-fueled empty promises and the associated publicity stunts. The upcoming rejection of the UBI proposal on June the 5th will and should serve as a reminder that the Swiss still remain the exception to the rule.